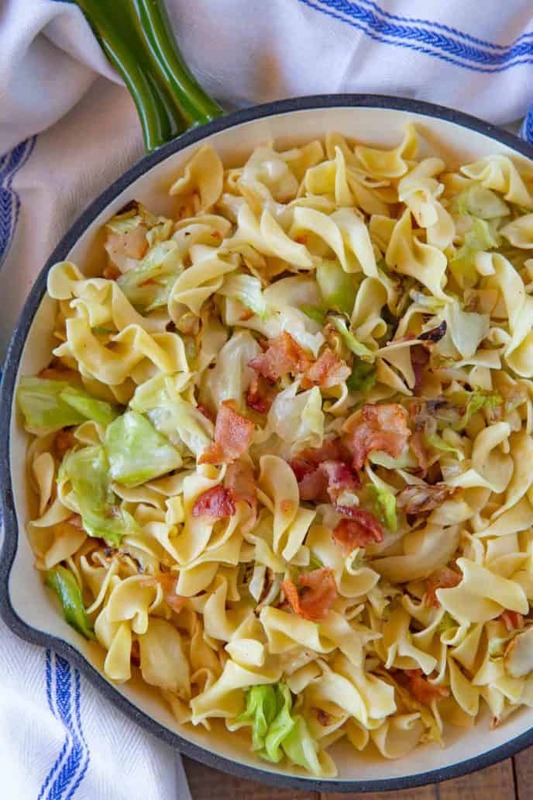 Haluski Noodles are the PERFECT one pot comfort food, made from noodles, cabbage, and bacon sautéed on the stove in butter, then finished in the oven, ready in under 45 minutes! 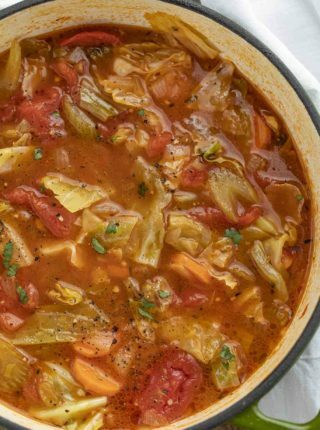 St. Patricks Day is coming up soon and all the cabbage recipes we love are front and center right now including Cabbage Soup, Stuffed Cabbage Casserole and Cabbage Steak. Haluski is one of my all-time favorite side dish recipe to make when you’re craving comfort food, because it’s EASY to make and ready in less than an hour. 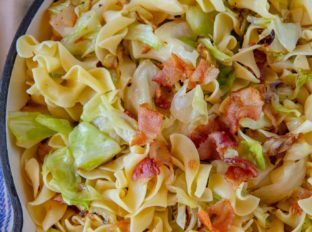 It’s cooked with egg noodles, bacon, onion, and cabbage that’s sautéed and then baked. You can also finish this on the stovetop if you’re short on time, in the same pot you just cooked the noodles in! 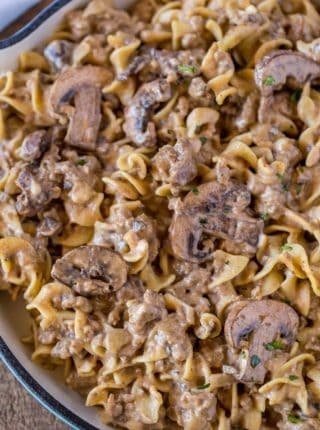 If you want another egg noodle dish you’ll love try my favorite stroganoff recipes including Crazy Tender Beef Stroganoff and Ground Beef Stroganoff. This is my favorite dish to make when we have a potluck, or when we’re having a lot of people over because it’s made with basic ingredients that go a long way. Plus everyone enjoys this comfort food! WHAT DO YOU SERVE WITH HALUSKI? 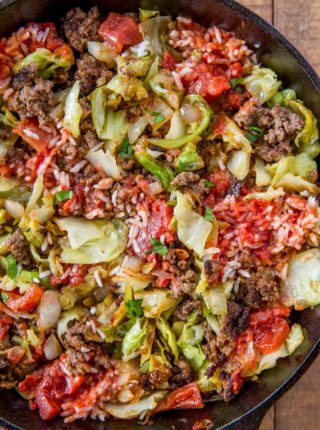 Haluski can be served with a hearty main dish like ground beef stroganoff, corned beef, or cabbage casserole. WHAT COUNTRY IS HALUSKI FROM? Haluski is traditionally found in the Czech Republic, but you can find versions of this comfort food all over Eastern Europe. Some versions will have dumplings instead of noodles, while others include potatoes. The Polish version will often have stir-fried cabbage instead of potatoes. HOW DO YOU REHEAT HALUSKI? Haluski can be reheated on the stovetop with 1-2 tablespoons of water, or in a baking dish at 325 degrees F until warmed through. Keep in mind that the pasta may turn out softer the second time it’s heated through. 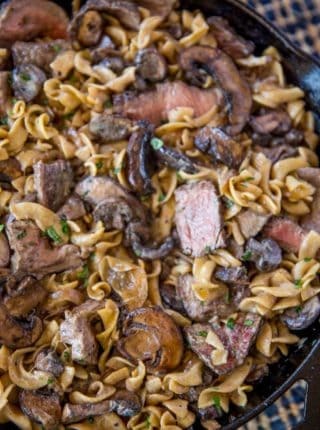 If you plan to make this ahead of time and freeze, I would undercook the pasta slightly, then follow the recipe up until pouring everything into the baking dish. Then let it cool, wrap tightly in plastic wrap and tinfoil, and freeze. Then when you’re ready to make it, let it defrost the night before in the refrigerator, and bake it in the oven according to the recipe until the egg noodles and cabbage are cooked through. Add a tablespoon or two of either oil or water, if the pasta seems dry at all. In a skillet, brown the bacon until almost crispy. Add cabbage, onions, and all other ingredients to crock pot, except noodles. Cook on high for 4-5 hours, adding the noodles for the last hour. If you add the noodles too early, they’ll get mushy and won’t taste right. Cook the noodles according to directions, then set aside. Using the sauté function, add bacon and cook until not quite crispy. Add cabbage, onions, and butter. Lock the lid and close the pressure valve. Cook the cabbage mixture on high manual setting for 3 minutes, then let it naturally release. Add the noodles just before serving (so the noodles don’t overcook in the instant pot). Add salt and pepper to taste and serve. The butter is an important part of haluski, so don’t skip it, or it won’t have a traditional flavor. Add 1/2 teaspoon of garlic (or a sliced clove of garlic) or extra black pepper, or add sausage for some new flavor. Use spicy sausage for some heat, or ground sausage that you won’t have to cut up. You can make your prep faster by buying pre-shredded cabbage, or slice your cabbage ahead of time and refrigerating until you’re ready to cook. For a low carb version, leave out the noodles (or use less noodles) and just add cooked cabbage with bacon and onion. You can use green cabbage or savoy cabbage, depending on what’s available at the grocery store. The egg noodles add a lot of flavor to this recipe, but you can use regular pasta or noodles in a pinch. Add 1/4 teaspoon of cayenne pepper and extra black pepper if you want to make this pasta spicy. Make this side dish creamy with 8oz of cream cheese, cottage cheese, or a cup of sour cream, added to the skillet when you sauté the noodles in butter. A lot of haluski recipes call for homemade pasta or egg noodles, but I like to make this as quick as possible so I buy ready-to-cook noodles at the store. You can add ground turkey, beef, or pieces of leftover ham, kielbasa, sausage, or chicken to add more protein to this dish. Add some more vegetables to this dish, like peas, spinach, or mushrooms, and sauté with the bacon in the beginning. Preheat the oven to 350 degrees and cook the noodles in a large pot two minutes shy of the directions then drain and set aside. Add the bacon to the pot and cook until just before crisp on medium heat then remove the bacon (leave the fat) and add in the butter, onion and cabbage, cooking until the onion is translucent, about 5-6 minutes on medium heat. Add in the noodles, bacon, salt and pepper, mix well and pour into a large baking dish or skillet of choice and bake for 30 minutes (See note for stovetop method). 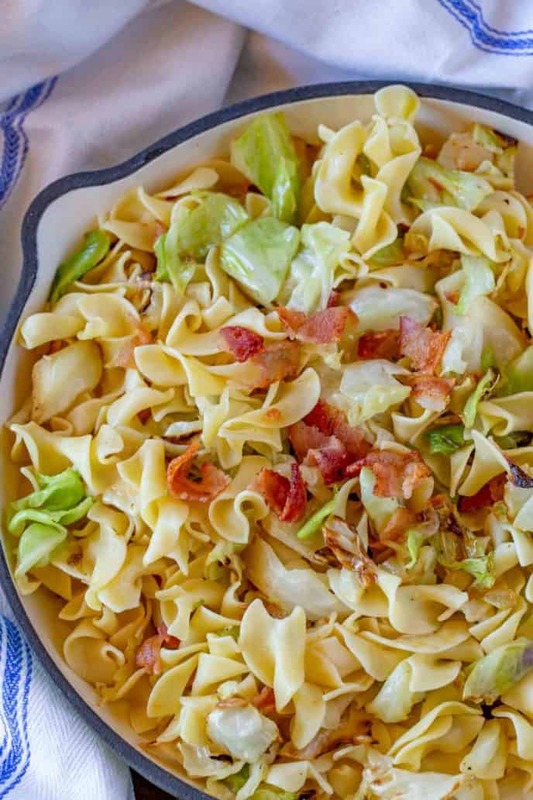 If you'd prefer to skip the baking process you can cook the onions and cabbage down further until they're browned more, then add in the noodles and let them crisp in the pan a little before adding the bacon back in and tossing it all together. Since there is no additional binding ingredients in this dish the baking process does nothing for this recipe that a quick five minutes on the stovetop wouldn't do as well. It is just the traditional way of cooking it. Being the grandson of Russian Jews that immigrated here around a century ago, this was a staple dish in my family. I don’t remember bacon being used growing up but we discovered started using it 4-5 years ago and it changed it from a side dish to a main dish. I think cabbage was a staple back then. I can still taste the holishkes which are sweet and sour cabbage rolls. I married a woman whose mother came from Ireland so we now have combined this dish to go alongside the oven baked corned beef for St. Patrick’s Day. Made this last night. Delicious. My husband is Hungarian and this is a traditional dish from his childhood. He cooks it on the stovetop, no baking. We eat it as a main dish, not a side dish, with sausage. This is our favorite comfort food! We call it “cabbage and noodles” it can also be made with gnocchi or cavatelli ?? That’s a great idea, Eileen! Ummmm, ummmm, ummmmm……..I love all these ingredients! I used to make something similar with homemade whole wheat noodles, sausage, onion and cabbage. I will be giving this a try SOON….I can taste it already! I hope you enjoy it, Vicki!